The TAAC is a large (even by VME bus standards) double-plane board that fills 3 slots in a "deskside" chassis Sun. I realise the photo is a bit blurry, but off to the left is a 1 foot wooden ruler, making the card about a 15 inch square, and it weighs about 12 pounds. There are eight BNC type connectors (visible in the upper right of the photo), 4 for video in and 4 for video out (RGB+Sync). 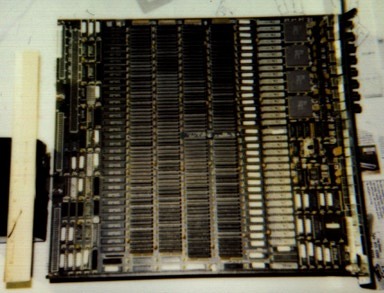 A large amount of RAM chips and some large square chips (I assume they are processors) populate the board. As the board is really two boards stacked one on-top of the other, I wasn't able to get a very clear look at the lower board. I was naturally curious as to what the board did. Despite it's name, my Sun 3/160 didn't seem to run any faster regardless of whether the board was in it or not, and I couldn't get video out of it simply by connecting a monitor. Thus, I tried to figure out how I could access the card, since it seemed to have it's own ram and processors. It looked like a "computer within a computer", and I started my search for information. A web-search was mostly fruitless - I have posted that info via this link - so, instead, tried to find those responsible for the creation of the TAAC-1. On January 7th, I located some of the people who first built the TAAC-1. The board was originally built by TRANCEPT SYSTEMS, and later on, the company was sold to Sun Microsystems. board, it would replace that window with TAAC-generated video. an assembler, and some libraries for doing certain common tasks. isn't a general purpose machines the "best circumstances" are pretty rare. Now - where to find software and documentation? You might try asking on the comp.graphics usenet groups and see if there are any folks still running a TAAC or who might have some software or docs. While ancient hardware actually is something I'm interested in (why else would I own a Sun 3? ), programming the TAAC just didn't seem like something I was going to find the time for. Paul Ramsey expressed interest in obtaining my TAAC for memorabilia reasons, and so, I pulled the card and shipped it off to him. The SUN runs alot cooler with the board out and frankly, I'm trying to find RAM to fill those slots. A "high-end" graphics engine is too much of a luxury on a Sun 3.